This one’s not about dead people for a change. It’s about a normal week in my possibly (or not) abnormal life. Who defines ‘normal’ anyway? Well, we’ve had some hilarious times this week in this madhouse we call home. As usual the bold husband who’s a bit of a klutz, has kept us amused. He is one seriously funny man; albeit a reluctant and unwitting comedian. Having tripped yesterday over an oversized set of drawers (no smart remarks please) that I recently purchased, he narrowly missed catapulting through the window. Sadly, I don’t have it on video, or the disgusted look on his face as we fell about laughing. You’ll be glad to hear he’s got over the indignation phase and has grudgingly acknowledged his part in the hilarity. The chest of drawers though didn’t fare quite so well and is now being re-sold; I had to concede that despite its undeniable beauty, it just didn’t bloody fit. I’ll remember it with fondness though. Despite the merriment of husband-induced laughter, It has to be said that I’m rapidly turning into a female version of Victor Meldrew, a Victoria Meldrew. Even a mundane visit to the hardware shop can prove to be a frazzled affair. Yesterday, as the sun shone down for one of its few appearances of the year so far, I decided that it would be quite nice to have an outside umbrella; the previous one having blown off to some distant land another summer’s day. So off I toddled to the local hardware and after much dithering over the choice of colours, I chose a lovely green one, complete with concrete stand which I was reliably informed weighed 15 kilos; fabulous, this wouldn’t blow away in a hurry. The cashier was a strapping young fella aged about 20. Once money changed hands, this perfectly able-bodied specimen of a man preceded to avoid my gaze for fear of having to lift the aforementioned 15 kilos to the car, which was parked in full view outside the shop window. Now while I’m actually quite capable of lifting and transporting heavy objects myself and if he had offered I’d have say “no, sure it’s grand thanks. I’m just parked outside”, the fact is he didn’t. So as Mrs Meldrew would have it, I huffed and puffed and made a big scene about lifting my now ‘bought and paid for’ concrete parcel; he turned away feigning oblivion. 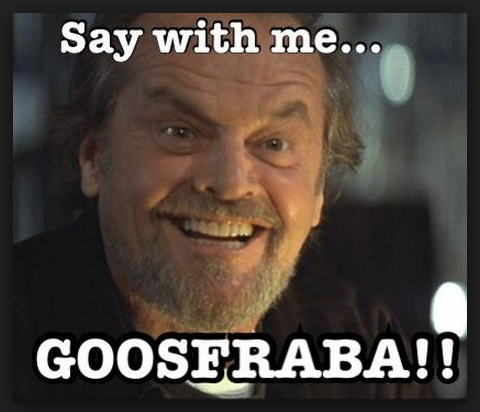 So I waited and waited and waited for him to eventually make eye contact, whereupon I stated in as loud a voice as possible “I’ll carry this to the car myself then shall I?” Goosfraba, Goosfraba. Where’s the anger management classes when you need one? I then laughed heartily all the way home remembering the indignant look on his face. Whatever happened to chivalry and good manners? Before anyone points to my previous reference to ‘equality’, it’s not a gender issue; I have happily helped many a delivery driver (usually male) with their heavy products. Are we failing to instil basic human decency into this generation? Either I’m getting grumpy in my dotage or there’s a seriously contagious jobsworth epidemic in Ireland. It should be noted that it’s a rare occurance in Wicklow though and most shopkeeping Wicklowites are perfectly helpful and charming. Now off to find some new drawers..